Lough Derg is the largest lake on the river Shannon, which stretches over 340 Km from county Cavan in Ulster to where it enters the Atlantic ocean at Limerick. Lough Derg is the third largest lake in the island of Ireland, after Lough Neagh and Lough Corrib and is known as the best fishing lake in Ireland. It is over 30 Km in length, 15 Km wide at the widest and covers over 13,000 hectares. 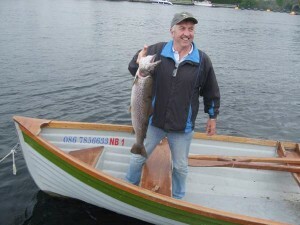 Lough Derg is a prime location for a fishing holiday with its many fish species to suit every angler. The lake is especially famous for its brown trout and pike fishing, and also has abundant numbers of perch, roach, salmon and bream. The fishing season begins in March and is at its highest when mayfly season starts, in late April or early May. The best flies to use are mayfly patterns or live mayflies can be dabbed. There are plenty of boats for hire rel=”nofollow” in Killaloe, Mountshannon and Portumna. These boats will be equipped with lifejackets as the wearing of lifejackets is mandatory on Irish waterways. Other equipment, such as landing nets can often be hired along with the boats. Local guide services can usually be hired for half a day or a full day in many of the towns and villages around the lake. These local guides have extensive knowledge of the best fishing spots on the lake. Fishing is free, except for salmon fishing, which requires a licence. The Lower Shannon Trout & Coarse Fisheries Development Society develops local angling and anglers can support fishing on Lough Derg by, voluntarily buying share certificates in the local fishing tackle shops. All legitimate angling methods are allowed, but there is a 35cm size limit, where trout smaller than this must be returned alive. There are plenty of opportunities for shore fishing, for those who are not comfortable fishing from a boat. There are stands to the lake, on the western shore, at Twomilegate, which are suitable for disabled anglers. The best time for fishing here, tends to be during late evening, overnight or early in the morning as fish tend to go to deeper water during daytime. The best methods for fishing on the lake are trolling, spoon & plugs and trolling dead bait from a drifting boat. Best results are obtained from varying these tactics. The pike is the largest fresh water fish in Ireland’s waterways. The record pike caught on Lough Derg is said to be 92lbs, in the late 1800’s. Pike caught these days do not come near this, but 20lb pike are regularly caught and 30lbers are not uncommon. There is a European Pike angling Competition, usually held on the third week of September. This competition draws expert and amateur anglers from all over Europe and beyond. Killaloe and its sister town, across the bridge, Ballina, are located 25km from Limerick city and about 50km from Shannon airport. These towns are the centre for coarse fishing on the lower Lough Derg. TJ’s angling center on the Ballina side of the bridge is an excellent place to get advice on the best places to fish, on local guides and boat hire. Lough Derg is the ideal fishing holiday location, for the recreational angler to the seasoned expert and once you experience the excellent fishing here, I am sure that you will want to return for the fishing in Lough Derg again.